Detective Sherlock Kammen is willing to trail his boss to find out where Martha and her sorceress are. But how far will he go when the trail leads to one of Ned’s family members? Find out in “Happy in this, she is not yet so old but she may learn,” chapter 21 of Martha’s Children, my serial about cops and vampires in 1969 Chicago. If you’re not already reading this story, you can start here. For me, this trip was important. No one in my family had gone to a four-year-college. I was going to be the first. So I had to get it right. Now I was in a good preparatory school and was a good student, so my school’s college adviser said I should aim high: Ivy League schools and their peers. At the same time, he told me not to go too far geographically, so that I didn’t strain my family’s finances with travel expenses. By the summer before my senior year, I had narrowed my list down to seven schools: four within a day trip of my Massachusetts home, two in Pennsylvania . . . and the University of Chicago. You knew I was going to fit Chicago in here somehow, didn’t you? So, the college trip was to spend a week in the summer traveling out to Chicago, and then swinging back through Pennsylvania to pick up the two schools there. And this would be my first trip to Chicago! So my parents and I set off in a Ford to cross Massachusetts, New York, Ontario, Michigan, and Indiana to reach Chicago. However, we were on a budget, so we didn’t actually stay in Chicago, no. Instead, we stayed in a motel in Michigan just that side of the Indiana state line. Which meant that every day, to get to Chicago, we had to travel through Gary, Indiana. Gary was a big steel mill town in those days, and there was an ever-present bank of smog hanging over the city, making travel through it akin to experiencing gas warfare. We would roll up the car windows the moment we hit the Indiana state line, and not roll them down again until we were in Illinois. But it wasn’t enough: the smog crept into the car through the vents, gradually befouling the interior. After the first pair of times traveling through Gary, we took to a detour around the city to the south to try to escape the fumes. 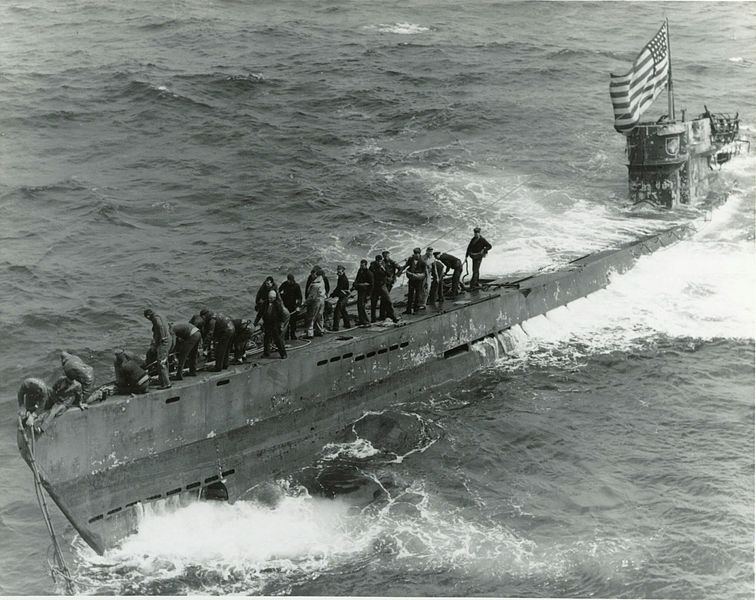 The U-505 shortly after it was captured . . . In retrospect, I’m surprised at how little I remember about Chicago from that visit. We played tourists for two days and visited the campus, with the obligatory meeting with the admissions office staff, on one day. The place that stuck in my mind? Not the U. Chicago campus. No, what I remembered most vividly was the nearby Chicago Museum of Science and Industry. And what did I remember most about the museum? They had a captured German U-boat from World War II! I wonderied just how it happened to be that a naval vessel would end up in a museum a thousand miles inland.
. . . and in the museum today. It was probably a sign of things to come that I remembered so little about visiting U. Chicago. I did apply there, along with four other schools. (Two I had been considering I dropped. One was my token all-male school, and the other had a particularly nosy application form.) But I went elsewhere. The next time I visited Chicago, I’d be on a transcontinental train, hunting for a job after college. This entry was posted in Martha's Children, Writing fiction and tagged Chicago, college, fantasy, Fiction, memoir, submarine, supernatural, Travel, vampire, Writing. Bookmark the permalink. I would have been distracted and fascinated by the U-boat too. That story probably says something of your deeper psychology – or only that, deep down, you didn’t want to go to Chicago. From my brother’s tales (he spent a lot of time there in early 1980s) I can’t say I blame you. Though it’s hard to recall, I think it became my token school outside the Northeast, and the school I really wanted in that role was Stanford, but the college adviser talked me out of that. Since I didn’t even consider U. Chi. for grad school either time, yeah, I guess I really didn’t want to go there.